Red Beans and Rice makes a super hearty weeknight meal your family will love! Red beans and rice has been one of our easy go to meals since the early years of our marriage. My sweet MIL shared this recipe with me years ago. She started making it when they lived in New Orleans for Medical School. It’s an easy dinner in that you can always have all the ingredients on hand in your pantry. Served with some kind of vegetable…something green. I had to laugh…we had it the other night with green beans. So red beans AND MORE beans! (haha) Whatever works! For this recipe, we used Butterball turkey sausage and it was so good with it. Just slice them up into 1/2in. pieces, and brown them in a pan. Set them aside until ready to add them back into the sauce later. It makes a a great Monday Night dinner. 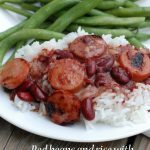 Rice and cans of red beans are both great pantry staples and turkey sausage is a super easy protein to add to this classic dish. Here’s the recipe. I have changed it up from when we first started making it. I like more of a sauce, so the immersion blender is so helpful for blending some of the red beans into a sauce. Start by rinsing your rice and then steam the rice with the water in a rice steamer or a covered pot. 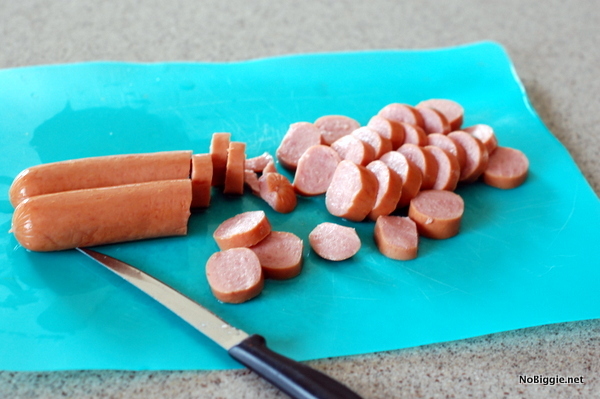 Slice the turkey sausage into 1/2 inch slices. 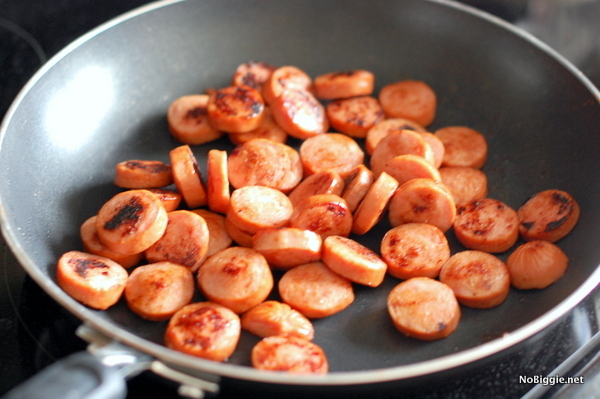 Sauté the turkey sausage in a pan on medium high heat until you start to see browning on both sides as you toss them around. Add one can of the beans into the pan where you sautéed the sausage. With an immersion blender, puree the beans with the chicken stock, onion and garlic powders, salt and sugar until smooth. Now add in the second can of rinsed beans. Let it come to a boil. Simmer for 20 minutes. 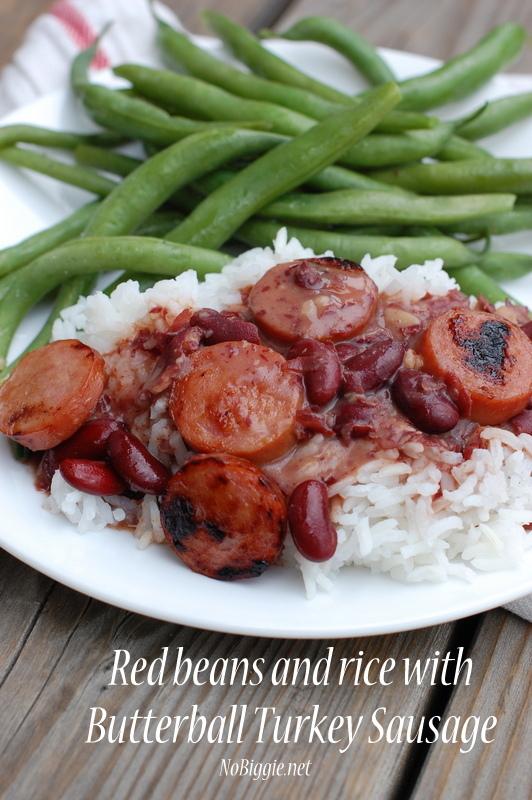 Serve over the steamed rice layered with the bean mixture and topped with the turkey sausage. You can also mix the sausage into the beans. Serve warm. That’s it! It’s a recipe my whole family loves. I hope your family likes it too!